No matter what you're talking about, it's hard to understate the prominence of New York City. Not only is the metropolis considered one of the world's greatest, it is also a definitive authority on popular culture from literature to music. It's housing of the United Nations is only the symbolic cherry on top. What then is a such a prominent city without it's icons? Well, we're lucky that the many symbols that have come to define New York City are perhaps just as prominent as they city they inhabit. However, the origins and reasons for their ascendancy into legend isn't that easy to uncover and is often hiding in plain sight. We'll take you on a whirlwind tour around New York City's famous icons and at the end of it, perhaps you'll be able to justify a trip to the Big Apple. Before all of the third wave coffeehouses that now dominate New York’s coffee culture came to bear, New Yorkers mainly got their coffee fix from local bodegas. Yet, no matter whether your morning pick me up was a cup of steaming hot chai or a hastily prepared Americano, it would have been likely that your drink would have come in something that’s called the Anthora cup. The nomenclature of the Anthora cup owes its origins to the Greco-Roman amphora, which was a vase used to store precious liquids like oils and wine. In true New York fashion, the word amphora was however misconstrued to be anthora. By the time anyone realised, it was already too late. Nevertheless, the cup's designer, an employee at Sherri Cup Co., did get something right. In sticking to the intended Greek theme, designers rightly chose the Greek key (the pattern runs along the top and bottom of the cup) as a symbol of 'Greekness'. The cup was after all, designed to specifically appeal to Greek-owned food vendors and coffee shops. What the designers of the cup could not predict however, was that cup would go mainstream. At launch, many non-Greek bodegas and deli owners were enticed by the colourful and unique design of the cup, not least due to the happy refrain, ‘We are happy to serve you’, that adorns the cup’s face. This refrain is also lettered in a distinct font, undoubtedly chosen to resemble ancient Athenian letters (with its bent corners), further 'Greekifying' the affair. Since its launch in 1963, the cup’s sales continued to grow, peaking in the 90s as bodegas and food trucks sprouted up across the city - before the impending Starbucks revolution took over. That being said, many minimal cup designs have edged into the 'cup design space' in New York City. However, that doesn't meant that the Amphora is going away - it's design is already etched into the identity of New York City as a recognisable icon known on a global scale. Just watch any TV show that's filmed in New York City and you'll know what we mean. New York City’s iconic subway network is known far and wide as the world’s most extensive underground rail network. From the earliest origins of the system stretching back to 1904 with the IRT Broadway Line (now the 1, 2 and 3 lines), the subway has expanded greatly and now serves as the transport arteries of the Big Apple itself. However, just like London’s Oyster card, New York has its own unique system that allows riders to pay for rides on the subway - the MetroCard. The MetroCard was first launched in 1993 to replace the aging token-based system that was wasteful and hard to keep track of. The tokens also had to be changed whenever fares increased, resulting in just about 6 different tokens being made over 50 years. Currently, with the MetroCard standard, all riders have is a magnetic stripe enabled simple rail card that is used to validate train journeys. Yet, many consider the MetroCard to be obsolete especially in the face of contactless technologies. Across the world, many metro networks have already adopted contactless fare-cards, a huge step ahead compared to New York's 'swipe to pay' concept. Nevertheless, the MTA (who runs the NYC subway) has plans to overhaul the entire fare payment process by 2022, replaced the MetroCard with a contactless standard. This also allows for payment via a smartphone, credit and debit card, doing away with the need for a separate MetroCard in your pocket. This is a welcome change as after all, one of the biggest gripes New Yorkers have against tourists is that they don’t know how to use a MetroCard. That's however, still four years away at best even if one were to believe that the MTA would keep to its schedule. In the meantime, stock on up some unique MetroCard designs before they all disappear. We think that this particular design is pretty rad. Ask any tourist about what they think the most famous image of New York City is, and it's likely that most of them would settle on one answer - the Statue of Liberty. At present, the statue is a canonised icon for what many consider to be the world’s greatest city. But what are the origins of Lady Liberty? Well, in 1865, the renowned French intellectual Edouard de Laboulaye proposed that a gift from France to the United States be conceived in order to ‘reward’ the US’ stunning commitment to freedom and democracy. In essence, he wanted to draw attention (in France) to the role democracy and freedom played in creating the US’s success in commerce. France was after all deeply divided into pro-monarchist and pro-republican camps after the country emerged from the tumult of the French Revolution. 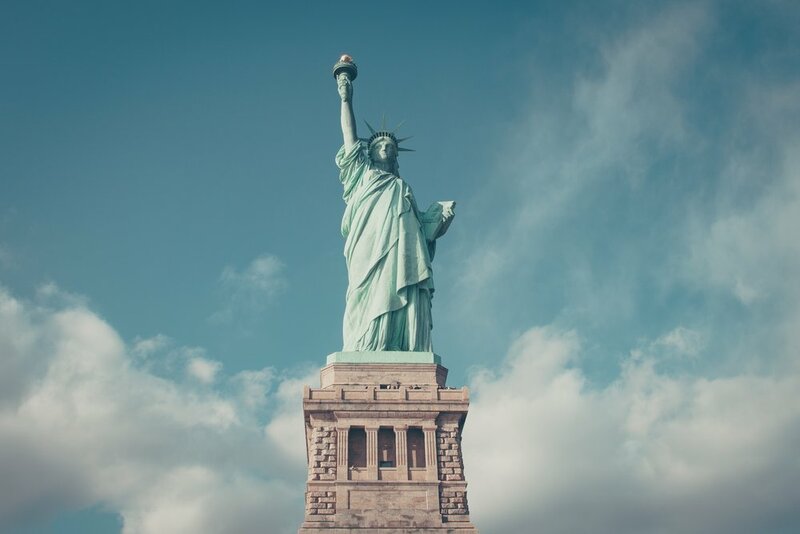 Originally named ‘Liberty Enlightening the World’, the Statue of Liberty was the brainchild of Frederic Bartholdi, a French sculptor responding to Laboulaye's clarion call. However, saying that Bartholdi was simply 'passionate' about the project belies the commitment that he had. Not only did he campaign heard in both countries for the project, he even took painstaking efforts to scour New York City for a good location before deciding on Liberty Island. Considering that statue was meant as a gift from France, the edifice was to be built in France, and then shipped over to the United States for the latter’s centennial. However, funding shortfalls and a lack of enthusiasm continued to delay the project until the eleventh hour. As the statue slowly materialised, Bartholdi even allowed people to pay to view incomplete sections of the statue as it slowly took shape. Though Bartholdi would not have been persecuted for voicing his wishes in the United States, the level of enthusiasm was weaker as this was in effect, a French statue. Indeed, neither the state nor the city, or even the Federal Government wished to commit funds towards the construction of the statue. Think this sound ridiculous? Well, you should know that the US only needed to pay for the statue's pedestal and not Lady Liberty herself. Unsurprisingly, though the physical statue was soon completed, it had to stand in a courtyard in Paris for many years as it awaited the completion of its pedestal. Through the intervening period, many other American cities across the country even considered bidding to have the statue in their city instead. It took a few more years before the requisite funds were finally raised through the efforts of Joseph Pulitzer and the New York World newspaper. By the time of its completion, the Statue of Liberty was woefully behind schedule - more than 10 years after its original deadline of July 4, 1876. Nevertheless, the completion of the statue was heralded as a triumph of architectural ambition, and as a stunning recreation of the Colossus of Rhodes (they look really similar) 2 millennia later. As a city of disparate boroughs, New York City’s transport infrastructure is nothing if not held together by it's many tunnels and bridges. As many locals consider the link between Manhattan and Brooklyn to be the city's most important, it follows that the bridges that span the East River (the Manhattan, Brooklyn, and Williamsburg Bridges) are its most iconic. Everyone who’s been on Instagram for the past few years would have seen that famous picture of the Manhattan Bridge in DUMBO (recreated above). Yet, despite being all the rage now, the Manhattan Bridge has for the longest time been overshadowed by the Brooklyn and Williamsburg bridges ever since it was opened to the public in 1909. For one, the Manhattan bridge wasn't open to pedestrians between 1960 and 2001 after safety concerns were raised, and still, many consider it to be visually inferior to the stone (and elegance) that makes up the Brooklyn Bridge. It was also not immediately usable by everyone since elements like the Manhattan connection to Bowery was not finished. Furthermore, whilst there were rail tracks on the bridge, these weren’t actually linked to the rest of the city's network of lines. Next, many architects consider the bridge to have been mired in faults ever since its construction. The much maligned head architect for the bridge, Leon Moisseiff, was roundly criticised at the time for utilising an imperfect understanding of bridge deflection theory during construction. He also decided to place streetcar tracks on the outer portions of the bridge, causing the bridge to become unstable as it would literally tilt to one side whenever trains ran across it. Moisseiff by the way, also designed the Tacoma Narrows Bridge, a stunning failure that resulted in a fateful collapse in 1940. As for New York City, repairing and fixing the faults of the Manhattan Bridge would come to plague all successive city governments and it is estimated that the repair works done at the turn of the millennium cost the city a cool $800 million. In any case, the modern day Manhattan Bridge seems to finally be attracting more attention and adulation - at least amongst tourists. In the area known as ‘Down Under the Manhattan Bridge Overpass’ (DUMBO) in Brooklyn, many buildings once useful in the district’s industrial past like the St Ann’s Warehouse have been repurposed into new retail establishments. The adjacent Brooklyn Bridge Park and the beautiful Jane's Carousel is also a huge crowd puller. To native New Yorkers, DUMBO (and the bridge that towers of it) has been a place of artistic and creative renaissance since the 1970s. Back then, artists and young designers began to skip Manhattan as rents become unaffordable. Hence, many settled in DUMBO (once called Gairville), making it one of the fastest growing districts of Brooklyn especially with its small neighbourhood vibe and its amazing view of downtown Manhattan. Many professed Brooklynites also consider the area as a hotbed of innovation as it continues to attract new entrepreneurs and startups. The DUMBO of today however, is a victim of its own success - it is now New York’s fourth richest community after gentrification set in in earnest. With so much interest in the area, it is perhaps heartening to see the Manhattan Bridge finally getting some appreciation both from locals and tourists alike. After all, it only took just about 100 years for it to get here. The yellow medallion taxicabs of New York City (as any visitor to the city would know) are an institution in its own right. Since time in memoriam, the cabs of the city have been transporting time-pressed New Yorkers across the boroughs especially from the central hub of Manhattan. However, few know just how tightly regulated the trade is apart from the obvious flat fares to JFK. Enter the Medallion system. Introduced in 1937, the Medallion system governs the operation of taxi cabs throughout the city (you can’t drive one without a Medallion licence) as a city-wide effort to limit the growth of taxi fleets. That is not to say however, that illegal taxi services aren't available, but most of these depended on secretive Chinese societies operating within the limits of cross pacific cultural links. In any case, many consider that the Medallion system has been successful at alleviating the traffic woes of Manhattan. However, while the policy has been effective, its level of effectiveness is intrinsically linked to creating a shortage of licences relative to demand, causing the price of the medallion (it's auctioned) to skyrocket throughout the years. At it's peak in 2014, the price of a Medallion licence amounted to $1 million. Despite this, the high fares and popularity of taxicabs in New York made the purchase worthwhile, even resulting in The Washington Post once calling it ‘the best investment in America’. Working jointly with New York City's other notoriously famous transportation network, the NYC Subway, the Medallion cabs of the city have been also been successful in keeping vehicle ownership low. This is a huge achievement especially for car-crazed America. The growth limits places on cabs have also popularised alternative forms of transport, ie. cycling. Since medallions are so expensive, taxi rides also (in some way) reflect the cost of that investment. It is for this reason that taxi cabs have endeared endears more riders to the NYC subway, bolstering the revenue of the entire system. Add to this the $0.50 tax on each taxi fare paid to the MTA, and you can see how the taxi system helps to maintain New York City’s legendary subway. This delicate balance between the high fares of ‘private transport’ subsidising the commons of ‘public transit’ has been a successful model for most of New York City's history. However, with the rise of disruptors like Uber and Lyft, this balance is under threat. Instead of bidding for a medallion and shelling out the money for it, drivers can simply sign up (for free) to ride-sharing platforms and provide essentially the same services as a normal yellow cab would. The auctioning and limits of the city's medallion system therefore, has been smashed. Even if one could consider the precipitous decline of a medallion's cost to be a good thing, this idea fails once you consider the fate of past medallion owners, who have seen the value of their investments decimated. In the hours before New Years' Day comes around, many tune in to await the Times Square Ball Drop, celebrating a tradition that has endured since the 1900s. ‘Ball clocks’ were however not always associated solely with this tradition as it was once used to help seafarers navigate and keep track of time. Ball drops in this instance was therefore actually quite commonplace with the first time ball in the US being built for the US Naval Observatory (now also the residence of the Vice President). It was only until 1907 when the enigmatic head of the New York Times, Adolph Ochs, was attempting to conceive of a new tradition that would endear visitors to the square adjacent to the paper's HQ. Before the ball caught on, the Times Square celebrations were marked an extravagant use fireworks to mark the occasion, but this was quickly banned for safety concerns. Ochs then conceptualised the use of the Naval time ball as an alternative, settling on a 700-pound iron and wood ball that would be lowered from the flagpole of the Times Tower as soon as the clock struck 0000 on Jan 1. By the way, Times Square is named as such because the New York Times used to be stationed there back in 1904. Before it ascended into legend, the square used to be termed the 'Longacre Square' but Ochs, the publishing magnate, was able to convince city authorities to rename the square in honour of his newspaper. Most would consider the effort to be a success most even though the Times moved elsewhere just a short decade away later. Still, its namesake square lives on. Throughout the years, the ball drop has been subtly modified to represent the mood of the city. During WW2, a moment of silence for killed and wounded soldiers were held instead of the triumphant ball drop. In the 80s, a red bulbs adorned the mast to represent the amazing ‘I <3 NY’ iconography. At present, the old halogen bulbs of balls past have been switched out in favour of modern LED ones. Furthermore, the current ball that you see being lowered every year has been in the business since 2008. It's also pretty heavy, weighing in at 5386 kg. And so, go ahead, give your special other a kiss when the ball drops. The Charging Bull in Downtown Manhattan perfectly represents the American dream as a symbol of the can do spirit the nation was founded upon. To this end, the sculptor, Arturo Di Moca, felt that New York City’s financial success should be rewarded with an iconic sculpture. Thus, in a subtle nod to the bull market, Di Moca attempts to push the notion of enduring American success through the image of the Charging Bull. In doing so, he also pays homage to the earnest workers that have built up America's many corporations - the same ones that have come to symbolise America’s commercial success. The Charging Bull was originally placed in the early hours of the day (before the trading opened) right in front of the New York Stock Exchange on Dec 15 1989. However, it was promptly whisked away by NYSE employees and was only restored to a triangular plot along Bowling Green at the behest of then mayor Ed Koch. Since the, the statue has enamoured group after group of tourists who mob the statue both for photographs. In recent months, State Street Global Advisors, an investment management firm, commissioned a statue known as ‘The Fearless Girl’ in 2017 to stare down at the bull in order to commemorate International Women’s Day, and the celebrate the achievements of women in all realms of modern society. The existence of the statue is also taught to be a statement to younger girls across the world that their futures held limitless possibilities. Despite being a symbol of feminism and positivity, the Fearless Girl unwittingly stirred up controversy in the city especially as people soon came to realise that almost all of the public statues in the city depicted men. Di Modica himself was also not amused, stating his work was hijacked and made to (incorrectly) look like a symbol of male dominance. He qualifies that his sculpture was meant to inject a newfound optimism into the city as at the time of installation, the Dow Jones Industrial Average fell by 22% amid a market crash. With all of this in mind, it is prudent to consider whether the perennial debate over the role of art in society has shifted. And by extension, is art meant to be viewed upon with the circumstances in which it was created? Or is it meant to adapt to evolving interpretations by contemporaries? It's easy to fall in love with New York City's buzz. Not only does the city have a penchant for awing visitors, it gives anyone (literally anyone) a litany of attractions and destinations to discover. It is thus not an uncanny coincidence that the city is able to attract so many tourists to its streets year after year. Owing to its success as a city embracing diversity and a hub for foreign cultures, the mere existence and intrinsic value of being from New York is perhaps what has propelled the icons we've looked at to global prominence. And so, with the continued reign of the Big Apple, now's a time no better than any other to visit the city. It's waiting.